Doris Roché-Hicks runs Friends of King Schools, where several of her relatives have worked. The state says three of those arrangements are against the law. In 2012 and 2014, the state ethics board charged Paulette Bruno and Doris Roché-Hicks with breaking state law because five family members worked at charter schools they run. Years later, the charges remain unresolved. Unanimous vote reverses last month’s stand, comes after RSD chastises board over enrollment concerns. The Louisiana Board of Ethics has filed charges against Friends of King Schools CEO Doris Hicks and three relatives after finding them in violation of state law aimed to prevent nepotism. The action follows a Lens story that reported Hicks had hired six family members. More than a third is paid off in first year of 10-year, interest-free loan. Schools run by the Orleans Parish School Board have been the top performers on standardized tests. That continued this year, but several charters in the Recovery School District inched past them. The challenge: Replicating what’s working. After-school tutoring and enrichment will continue at Friends of King’s two schools. State education officials renewed Friends of King’s contract with the federal 21st Century Community Learning Center Program, which enables schools to provide those services. Comment cards arrayed at board meeting, but no one comes forward and meeting is adjourned without inviting public comment. Algiers Charter Schools Association staff went on 19 trips over four years, including five out of state that cost $113,000. And new figures from KIPP New Orleans Schools show that it spent $133,000 on its trip to Las Vegas. All told, The Lens has added up $316,000 in travel for three charter organizations. Some charter leaders are wary of power shifts on an elected board. Others just don’t like those in office now. Item wasn’t on agenda released to the public. About 185 of KIPP’s 440 employees in New Orleans attended a national summit for KIPP staffers in Nevada. The trip cost substantially more than the $69,400 that Friends of King spent on a staff-wide retreat in Biloxi, Miss. But Kipp’s nine schools all have money in the bank, while one of Friends of King’s two schools posted a $1 million deficit. All of the approximately 180 employees of the two-school charter organization were invited to the Beau Rivage in August. The charter organization covered their hotel rooms and meals. A week later, CEO Doris Roché-Hicks told staff at one school that their pay would be cut 2 percent. That move saved about as much as the retreat cost. More charter schools now eligible to join Orleans Parish School Board, but will any take the leap? Charter boards overseeing 17 schools must decide by the end of the year if they want to move from the Recovery School District to the Orleans Parish School Board. But there are still reasons for schools to stay put, such as funding issues and concerns about the management and leadership of the local school system. The board shifted $705,000 from Dr. King Charter School to deal with an $848,000 deficit at Joseph A. Craig Charter. Doris Roché-Hicks apparently didn’t sign contracts with her family members, which would clear her from one set of legal concerns about their employment. But there are discrepancies between copies and originals of the same documents, and charter officials won’t discuss why they’re different. Editor of The Lens talks to board about failure to comply with open-meetings requirements. But the exemption to state nepotism law doesn’t appear to apply for Doris Roché-Hicks’ sister and son-in-law. Craig was on track to post a $671,000 deficit for the last school year. This summer, some Craig employees were laid off. Now that the charter movement has matured in New Orleans, there are fewer opportunities to grow. The head of the Friends of King charter school system has hired six relatives, including at least two whose employment appears to violate state ethics laws that ban nepotism. Chief Executive Officer Doris Roché-Hicks employs her sister, daughter, son-in-law, grandson and great niece. She also employs her son-in-law’s brother. State law prohibits the hiring of immediate family members, though not all of these relations meet the definition of “immediate family” in the law. In three recent testing years, 33 public schools have been flagged for problems and possible cheating on standardized tests — 12 more than once. A testing expert says these irregularities indicate cheating by teachers and administrators, who have a lot riding on their students’ performance. An added worry: Voucher program could reduce overall funding for public schools. The board voted unanimously to use the school’s $300,000 line of credit to cover the deficit, which one leader attributed to the cost of taking over Joseph A. Craig Elementary. The Friends of King board of directors has green-lighted a continuing search for grants to finance a pre-kindergarten program at Joseph A. Craig Elementary School and learning centers to supplement classroom instruction at both Craig and Martin Luther King Science and Technology Charter School. Passage of resolutions authorizing reapplication for the funding was the highlight of the directors’ monthly meeting, March 12, in the Craig library. The board that governs Dr. Martin Luther King Charter School and Joseph Craig Elementary will be meeting today at noon at 1617 Caffin Ave. The meeting agenda was posted on the school’s website and is available here. Board attorney makes race-based remark after Lens reporter points out lack of compliance with open-meetings law. Board members overseeing Dr. King Charter School in the 9th Ward say they are eager to get their high school students out of portable classrooms and into a new facility. 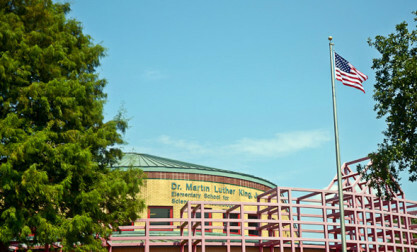 Dr. King Charter School will not be rejoining the Orleans Parish School District. Its governing board, Friends of King, last week decided against sending a letter of intent to leave the Recovery School District and rejoin the local school district as its improved academic performance allows. Accusations that the Recovery School District overloaded Joseph Craig Elementary School with special-needs students was a focus of the Nov. 13 meeting of Friends of King Schools, the board responsible for Craig as well as for Martin Luther King Science and Technology Charter School. The 403b faculty retirement plan was a focus of discussion at the monthly board meeting of the Friends of King School, Sept. 11. Friends of King School met in regular session on July 25, after passing budgets for the two schools under the board’s management: Martin Luther King School of Science and Technology and Joseph Craig Elementary. Principal Doris Hicks, chief executive officer of the schools, updated the board on an overture from a group of George Washington Carver alumni interested in getting Friends of King to help them apply for a charter to run their troubled high school. The board of directors who run Martin Luther King School of Science and Technology, as well as the Joseph Craig Elementary, approve budgets for the 2012-13 school year at their meeting July 19. Discussion began with the budget for Craig, which the Friends of King School board begins operating in the coming year. The Friends of King School Board released its budget for the 2012-13 school year at Martin Luther King Science and Technology Charter. It also released a budget for Joseph A. Craig Elementary, which the board will begin running in the coming year. Based on an anticipated enrollment of 685 students, the school expects to receive about $7.85 million in revenue, of which about $6 million will be per-student state and local funding. An alumni group from the failing George Washington Carver High School has asked Friends of King Schools, the board that runs Dr. Martin Luther King Jr. Charter School, to apply for Carver’s charter, King board members learned at their May 8 monthly meeting. A Carver alumni group recently protested the state-run Recovery School District’s decision to permit Collegiate Academies, the network that runs the highly successful Sci Academy, to take over the high school. The Carver alumni group has applied twice for the charter, but both applications were rejected by the state Board of Elementary and Secondary Education. The school’s board of directors has decided to seek an alternative to the expensive state-run pension plan, the Teachers Retirement System of Louisiana (TRSL). Sean Bruno, a certified public accountant, and Tony Monk, of the Morgan Stanley investment firm, addressed the board at its April 10 monthly meeting to explain the difference between defined-benefit retirement plans like TRSL, and the private 403(b) plans some other charters have switched to. School spending is in line with budget projections through the end of the year, provided grants that have been applied for come through. That was the message from the finance committee as directors of the Martin Luther King Jr. School of Science and Technology gathered for their monthly meeting, March 13. A visit by representatives of Junior Achievement New Orleans was a highlight of the Feb. 14 meeting of the school’s board of directors, the Friends of King. Parents of Craig Elementary School students got a chance on Jan. 26 to meet with the charter board — Friends of King Inc. — selected to take over the Treme school in an attempt to turn it around academically. The Friends of King School Board meeting began, after a short Christmas blessing, with the entrance of about 15 members of the high school fraternity, Mu Lambda Kappa (MLK), who described a recent trip to Denver. “We learned about the environment, ” sophomore Earl Thomas said, “and ways to make it better. The Friends of King Schools Board of Directors reacted to uncertain news of the school’s building assignment. While Martin Luther King Charter Elementary was assigned its current location on Caffin Avenue, the Recovery School District list makes no mention of the high school, which is still housed in trailers. Present for the board’s monthly meeting were President Hilda Young, CEO/Principal Doris Hicks, Secretary Cora Charles, and board members Gail Armant, Sandra Monroe, Thelma Ruth, and George Rabb. The Nov. The Friends of King school board cancelled their October meeting. The Board of Directors of the Dr. Martin Luther King, Jr. School for Science and Technology met Tuesday, Sept. 13, at noon.